NAIROBI, May 18 2016 (IPS) - Emma Masibo and Lucy Bwire have many things in common. They are both young, aged 23 and 24, respectively. But more than that, they’re both dreamers who have effectively translated their visions into a nature-friendly entrepreneurial mission. This is evident in the duo’s invention: a quiet, affordable solar-powered lawn mower that is attracting plenty of attention. According to Masibo, the students had been watching maintenance workers clear grass around the school using combustion engine-powered lawn mowers that emit noxious fumes and produce deafening noise. It was irritating and interrupted learning, in addition to the fuel costs that had to be shouldered by the school all year round. They decided something needed to be done and put their heads together, designing and building a prototype that is now in use at the school. At a cost of 180 dollars, it is a quarter the price of the traditional mowers. It has rechargeable batteries so it can conserve energy and enable mowing at night when there is no sunshine. It also carries a water bottle as an extra amenity. To facilitate mowing at night, the solar mower has a bulb that provides lighting. Mowing at night or in low sunshine spares workers the harsh tropical daytime blaze typical of many parts of Kenya. “From the gender perspective, the traditional mowers – either by design or inadvertently – appear meant for use by men. They are difficult to switch on. The noise and the smell of oil during combustion is intolerable to women. But solar-powered mowers are friendly to women. They are easier to start, one just has to use a switch placed near the handle to ignite the mower,” says Masibo. According to Bwire, it was easy for them to build the machine after designing it because the materials required are locally obtainable. The institute sponsored them and the only material they bought was the solar panels, a detector used to indicate when it is off or on, and batteries. Peter Wamalwa, a lecturer who also serves as their mentor, was full of praise for the young women’s creativity. “They sought a solution to a problem that our society associates with the male gender. That shows that their innovative capabilities are strong,” he said. He says the machine is scalable, so clients can go for units that suit their needs. Added to that, the mower does not require specialised skills to use and maintain. It can even be used to clean floors, thus substituting for vacuum cleaners which are beyond reach of many Kenyan households. “In this country alone, just imagine how many oil-powered mowers are in use and the impact of their emissions on the environment. Come to think of what will happen if a majority of households and institutions like hospitals and schools adopted the solar-powered lawn mowers in terms of benefits to the environment and huge sums of money that will be saved,” Wamalwa says. According to Wamalwa, the institute now intends to help the students commercialise their invention. “In the next two years we want to ensure all learning institutions acquire the solar mower,” he said. Masibo says they are already improving the design to develop a mower that is in the form of a wheelchair, making it ideal for disabled people. Wamalwa’s views are shared by Fred Matiang’i, Kenya’s education, science and technology secretary, who was moved by what he termed the high level of innovativeness of the two young women. 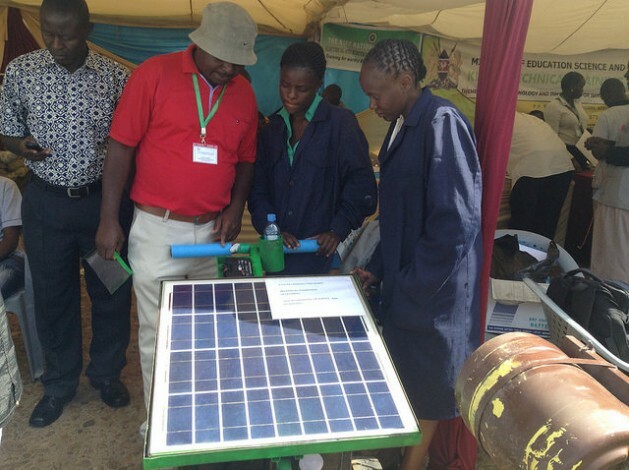 The cabinet secretary, who officially opened a five-day National Science week in Nairobi on May 17, said when he visited the Sang’alo Institute of Science and Technology booth where the two students were displaying their innovation that his ministry will link them with the industry alongside other young innovators to ensure mass production of the units. The science week attracted over 100 exhibitors. Participants included policy makers, scholars, academicians, scientists, students, entrepreneurs and innovators from national and regional institutions such as universities, research institutions, technical, vocational and entrepreneurial training institutions, international organisations and development partners. The device is able to cook and heat water simultaneously. The kitchen is a preserve of women in most Kenyan cultures, but the two male students thought the use of clean energy offers dividends to all and sundry. Indeed, in a country where the ministry of environment estimates that close to 80 percent of the rural population depends on charcoal and firewood for cooking, demand for cooking fuel is a great contributor to deforestation, which has a huge negative impact on the environment and thus people’s lives. “We realised that in the lake [Victoria] region, where we are based, sunshine is abundant and explored how we could harness it to benefit our communities,” says Ngetich. He explained that the available parabolic solar cookers were poorly designed, wasting energy since the sun rays were hitting their surfaces at a 45-degree angle, with much of the heat dissipating, and even burning users. “We improved on the existing technology and made it user-friendly with extra abilities. It can thus boil water and cook food simultaneously. It has 12 frames arranged in such a way that it concentrates the sun rays in the inside,” says Ngetich. The cooker is already being used in the institute. Mibei says its use has lessened dependence on firewood and electricity, thus conserving the environment and saving money. The pair has patented their innovation at the Kenya Intellectual Properties Institute. “People are already requesting for units after learning about them through exhibitions,” says Ngetich. The cooker is affordable, retailing at 10 dollars, and the materials used to manufacture it are sourced locally. Ngetich observes that solar cookers also save time compared to firewood. Food can cook without being attended to. This is a boon to women, who multitask other household work. Additionally, he notes, compared to firewood, they emit no smoke, sparing the women and girls who traditionally undertake cooking chores from respiratory diseases. Solar cookers have a long shelf life and the only major repair is replacing the aluminum foil. If the multipurpose solar cooker could be placed at the disposal of every household in Kenya, the impact in terms of lowering the cost of cooking fuel and conservation of the environment through lowering carbon emissions could be immense. Would love to take a look at this “multi solar cooker”!